Congratulations to Helen Monroe and Jewel Weed Theatre Company for their successful adaptation of James Reaney’s children’s play Apple Butter at the Fringe Theatre Festival in Kingston, Ontario this week. 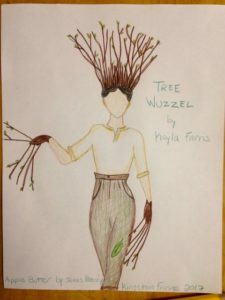 Originally conceived as a marionette play, this adaptation uses “actors, puppets, masks and a touch of magic” to bring the story of orphan Apple Butter and his sojourn at Hester Pinch’s farm to life. Jennifer Brook designed the puppets and masks, and Peter Jarvis composed original songs for the play. 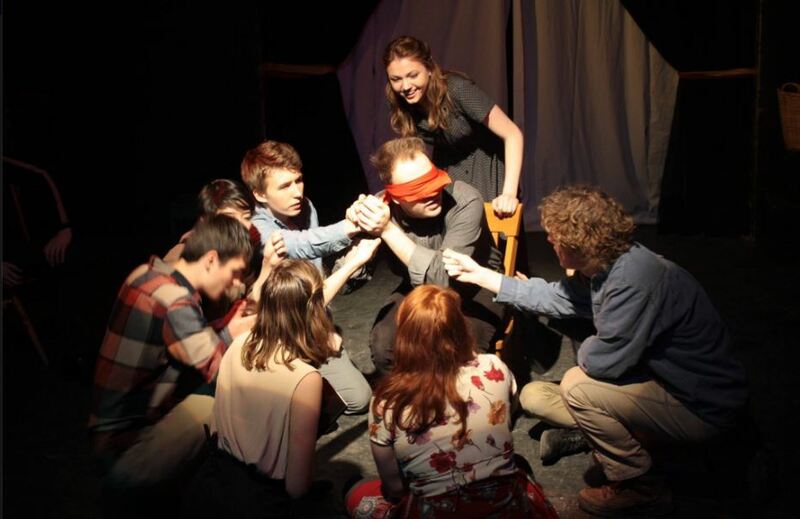 The performers are Nicola Atkinson, Adrian Beattie, Kayla Farris, Connor Marois, and Reanne Spitzer. 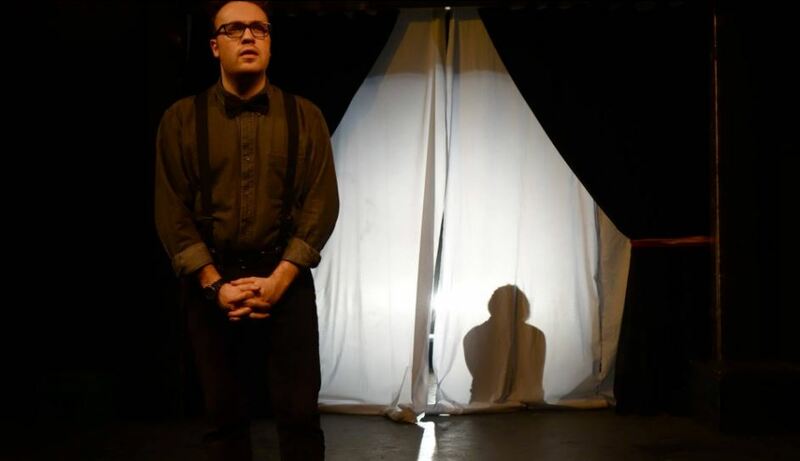 Part of this year’s Storefront Fringe Festival, the show runs from June 23 to July 1. 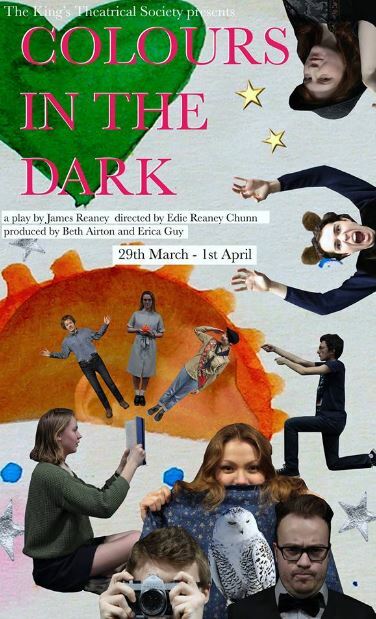 Order tickets here. 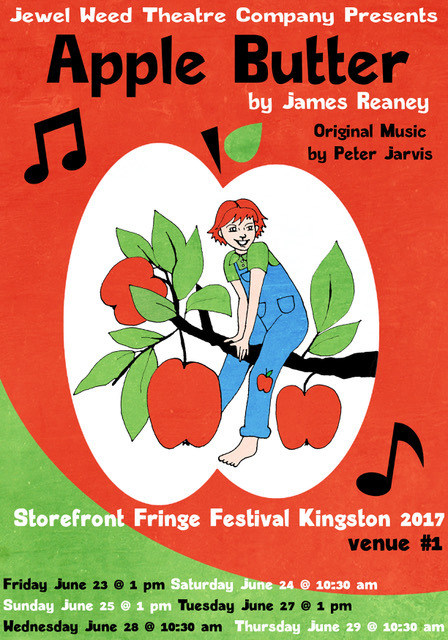 James Reaney’s play Applebutter at the Storefront Fringe in Kingston, Ontario, June 23- July 1, 2017. “Tree Wuzzel” design by Jennifer Brook. 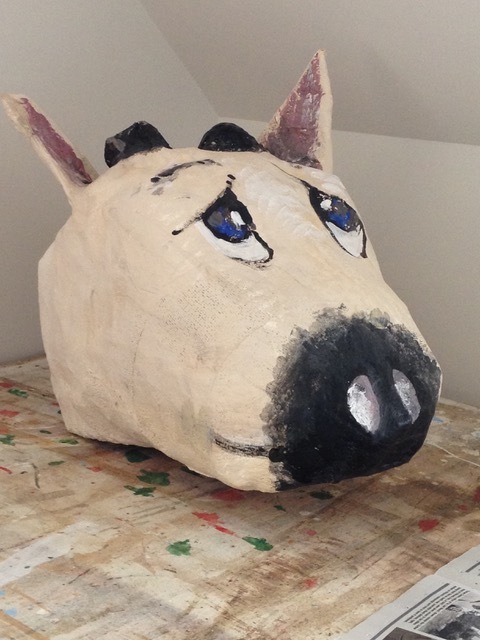 Design for “Moo Cow” mask by Jennifer Brook. 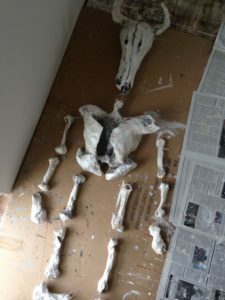 “Rawbone” puppet design by Jennifer Brook. 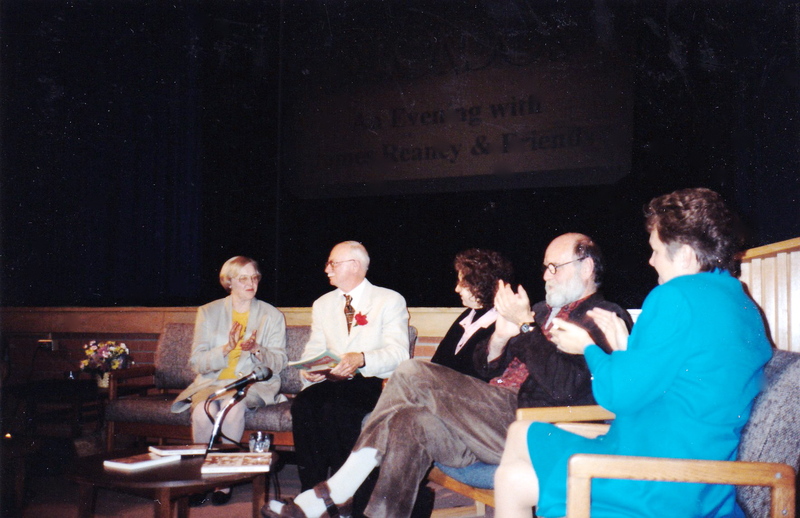 On May 30, 1996, “An Evening with James Reaney & Friends” was held at the G.A. Wheable Adult Education Centre in London, Ontario to celebrate the publication of The Box Social and Other Stories, a collection of James Reaney’s short fiction. 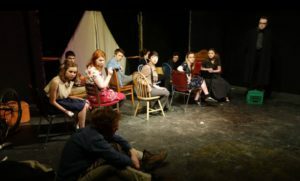 I was a student at the University of Toronto in the last years of the 1950s, and James Reaney — who had been cutting an odd swath there several years before — was still an oral tradition. He was known as an enfant terrible who’d published a scandalous story called “The Box Social,” which dealt with gynecological matters unmentionable at that time, and dealt with them in a shocking fashion. 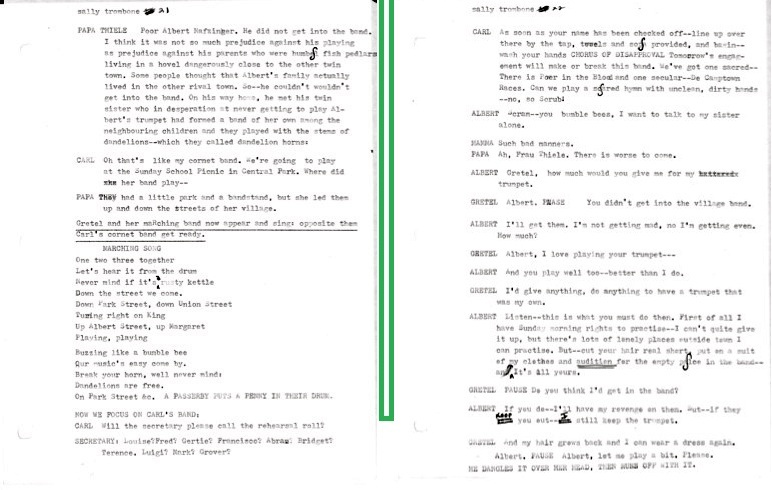 (Inside the box of the title — supposed to contain a lunch — there was a fetus.) 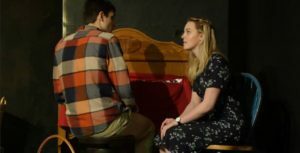 Nobody seemed to know where this story could actually be read, so its reputation was in consequence tremendous. (I’m happy to say it has now finally been republished.) 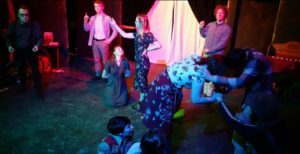 Reaney was also remembered as having staged a production of Beowulf in which Beowulf himself turned out to be the monster who was murdering and eating his own faithful followers. The more you think about that, the more plausible it becomes. After the introduction by Margaret Atwood, James Reaney had planned to read “The Box Social” for the audience, but decided not to and read “The Bully” instead. We were disappointed that he did not give voice to the long-lost story, but a friend from school days said that “The Bully” was an entirely appropriate story to read in a high school. See also “Southern Ontario Gothic and James Reaney” from June 2015. — Michael Hurley and Allan Hepburn in The Concise Oxford Companion to Canadian Literature, pages 593-594. William Toye, Ed., Oxford University Press, 2011. 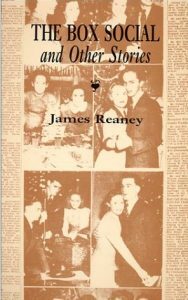 The Box Social and Other Stories gathers together nine of James Reaney’s early and more recent short stories and is available from The Porcupine’s Quill. May 30, 1996 in London, Ontario — Writers Colleen Thibaudeau, James Reaney, Margaret Atwood and Graeme Gibson, and producer Nancy Johnson of Lockwood Films. 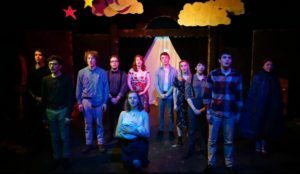 March 29, 2017 — Congratulations to the King’s Theatrical Society of King’s University College in Halifax, Nova Scotia, for their wonderful production of James Reaney’s 1967 play Colours in the Dark. 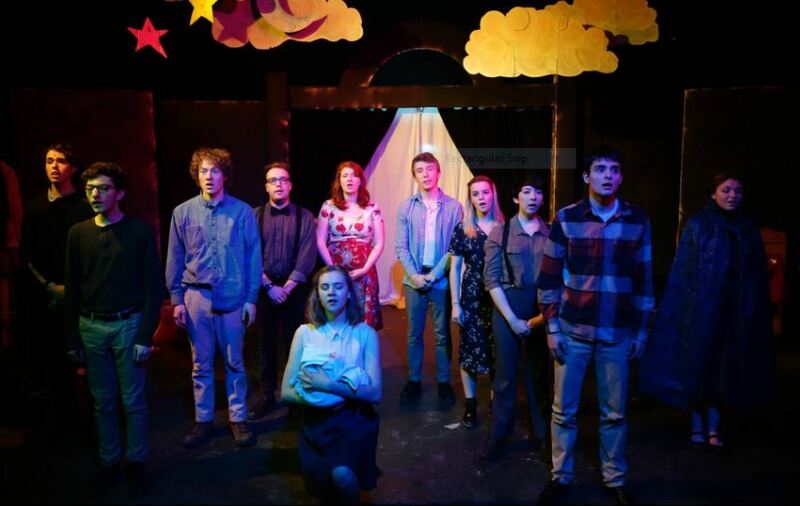 Thank you cast members Alex McVittie, Caleb Sher, Ella MacDonald, Frances Grace Fyfe, Jack Lewis, Jacob Hermant, Jeremy Earley, Julia Hancock-Song, Julia Schultz, Maxim Makarov, and Robert Sapp for your spirited performances. 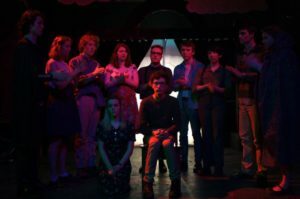 Colours in the Dark cast members: Maxim Makarov, Jacob Hermant, Jeremy Earley, Caleb Sher, Frances Grace Fyfe, Julia Schultz, Jack Lewis, Alex McVittie, Julia Hancock-Song, Robert Sapp, and Ella MacDonald. Photo by Erica Guy. 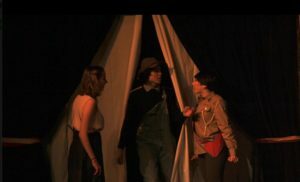 From Act I Scene 1: KIDS: Read our palms. Guess who we are. Act I Scene 10 with Jacob Hermant and Frances Grace Fyfe: SON: Oh, Sally, whatever is it now? 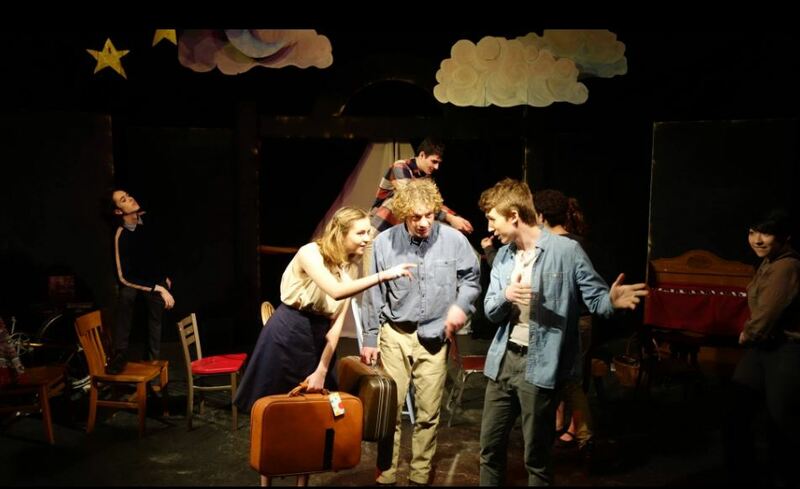 Act II Scene 5, The Music Lesson with Robert Sapp and Alex McVittie: TEACHER: What shall I set the metronome at? PUPIL: Set it at summer and pink and white and yellow bricks sunlight with blue sky and white feather dumpling clouds. End of Act II: … 8 great grandparents, 4 grandparents, 2 parents, one child. The King’s Theatrical Society (KTS) is a student-run theatrical organization, and every year students propose ideas for plays. The KTS Winter Season for 2017 also featured The Woman in Black by Stephen Malatratt (directed by Jessica MacIsaac), and Bone Cage by Catherine Banks (directed by Miranda Bowron). Here’s to more great plays next season! For more about the play, see Ophelia Stone’s review in Watch Magazine. 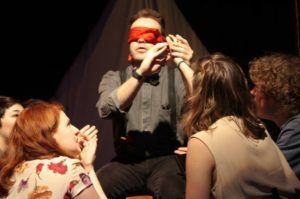 February 23, 2017 — The University of Toronto Opera Division honoured composer John Beckwith with an evening of music from four of his operas — The Shivaree, Night Blooming Cereus, Crazy to Kill, and Taptoo! 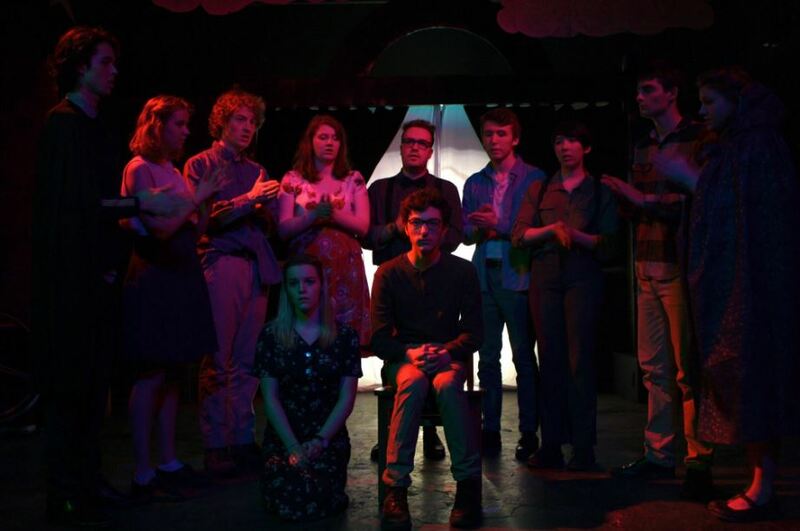 — all with librettos by James Reaney. The concert was held at the Arts and Letters Club of Toronto. On March 8, the University of Toronto Faculty of Music held a 90th birthday celebration for former dean John Beckwith, and he presented a lecture on Canadian music since 1967. 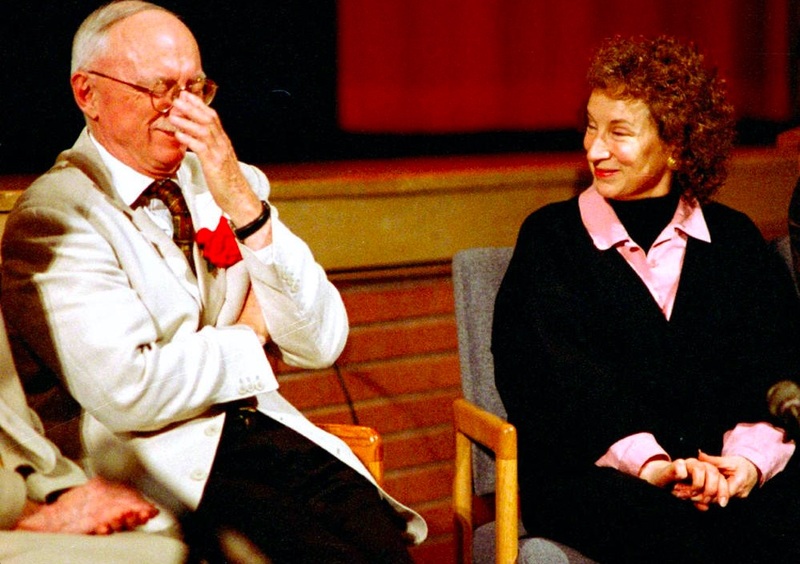 Congratulations on your 90th, John! 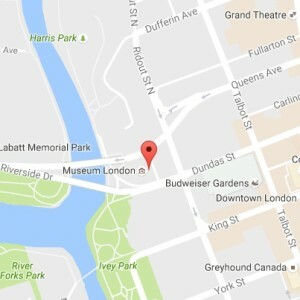 ♦ On March 23 his Fractions for microtonal piano and string quartet (2006) will be performed at Schulich Hall, McGill University. 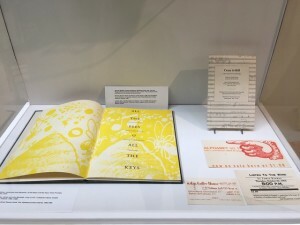 ♦ On April 28, New Music Concerts in Toronto will present a program he is curating, featuring his Avowals (1985) and the premières of two mixed instrumentation chamber works: Quintet (2015) and Calling (2016). 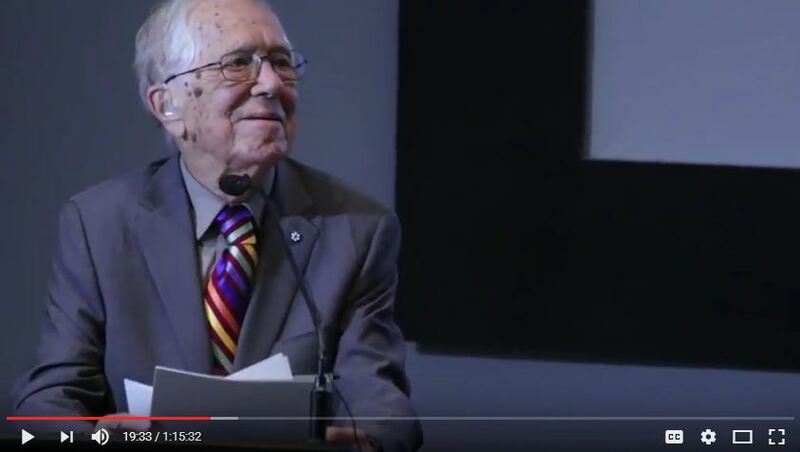 ((( ♦ ))) Archived recordings of John Beckwith’s music, including several Beckwith-Reaney works, are available for streaming at the Canadian Music Centre’s Composer Showcase. 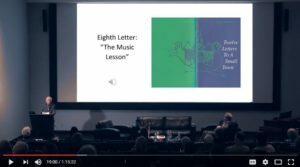 In his November 2016 lecture on “James Reaney and Music”, composer John Beckwith recalls James Reaney writing that “My experiences of opera were scrubbing kitchen floors on Saturday and hearing the Met broadcasts as I did.” What did Reaney mean, John wondered, his kitchen had more than one floor? 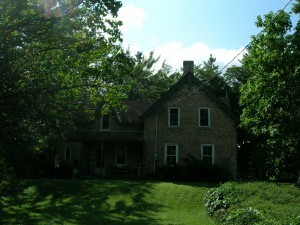 James Reaney’s childhood home near Stratford, Ontario — Summer Kitchen entrance. 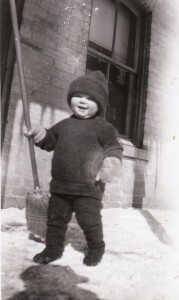 Yes, it turns out that “scrubbing kitchen floors” plural is accurate because the farmhouse where James Reaney was born in 1926 had two kitchens – a summer kitchen used May through October in the newer part of the house, and a winter kitchen used November through April in the older part of the house. 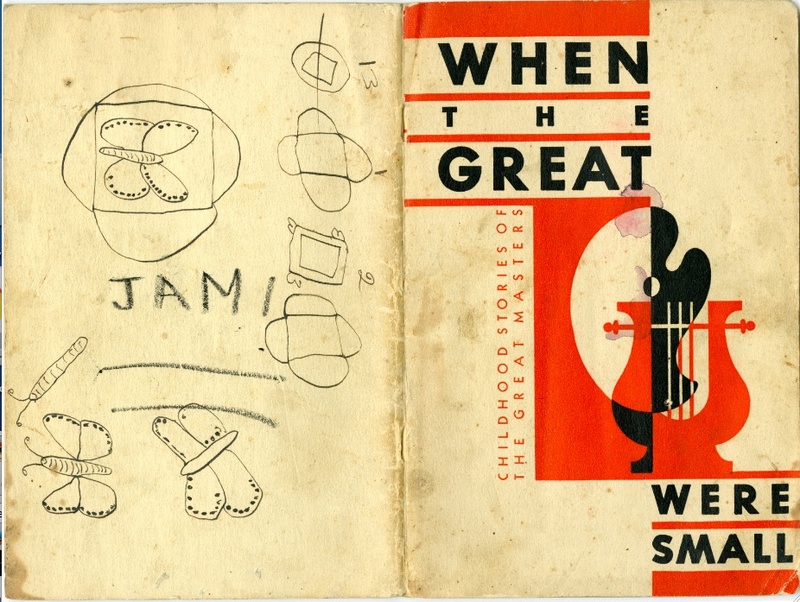 James Reaney’s boyhood copy of “When the Great Were Small: Childhood Stories of the Great Artists and Musicians as Told By Kellogg’s Singing Lady”, 1935 booklet for The Singing Lady radio programme, copyright Kellogg Company. 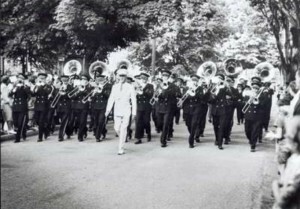 Image courtesy Western University Archives, James Reaney fonds AFC 18, Box A12-082-029. * These autobiographical excerpts are from James Crerar Reaney, Contemporary Authors Autobiography Series, Volume 15, pages 295-297, Gale Research Inc., Detroit, 1992. James Reaney, age 1 1/2 years, on his front porch (summer kitchen side) January 1928. 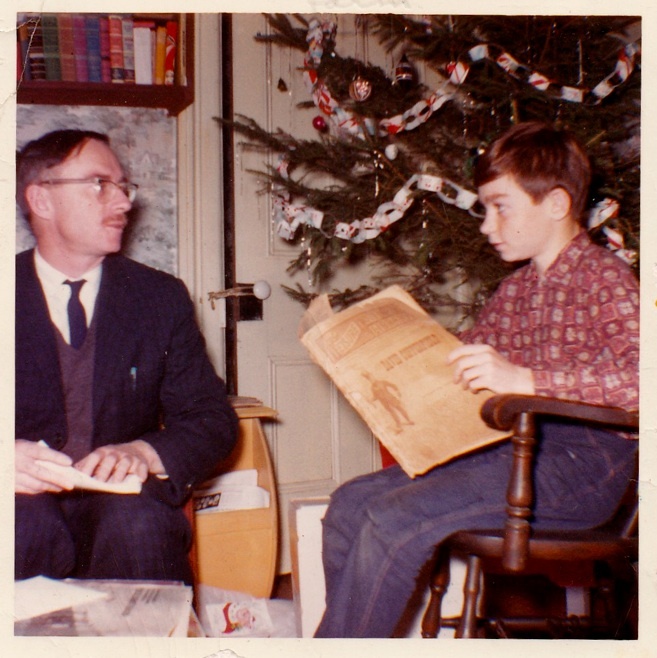 December 1964: James Reaney (Jamie) with his son James Stewart Reaney visiting the farm near Stratford, Ontario. 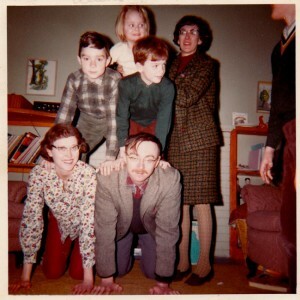 December 1964 in London, Ontario: Colleen, Jamie, James Stewart (age 12), John (age 10), and Susan (age 5) assisted by friends Eleanor Catto and Broughdaler Steve Keene. 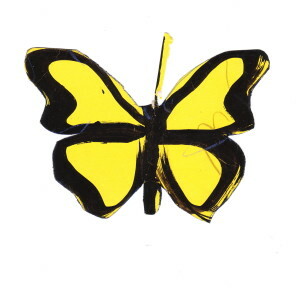 “All the Bees and All the Keys” (1973); illustration by Ross MacDonald. In his November 5 talk on “James Reaney and Music”, composer John Beckwith recalls their collaboration on a children’s story with symphonic music, All the Bees and All the Keys: “He said he had always wanted to write about a) bees and bee-keeping and b) small-town Ontario marching bands.” Beckwith also mentioned a scene in James Reaney’s play I, The Parade, where a penniless band with no instruments has to perform with dandelion horns. I, The Parade tells the story of bandmaster and composer Charles F. Thiele (1884-1954), bandmaster of the Waterloo Musical Society (1919-1951) and Father of Canadian Band Music. * Commissioned as part of the City of Waterloo’s 125th anniversary celebrations, the play was presented at the University of Waterloo in November 1982. Our music’s easy come by. On Park Street &c. A PASSERBY PUTS A PENNY IN THEIR DRUM. ALBERT: Gretel, how much would you give me for my trumpet. GRETEL: Albert. (PAUSE) You didn’t get into the village band. GRETEL: I’d give anything, do anything to have a trumpet that was my own. ALBERT: Listen – this is what you must do then. First of all I have Sunday morning rights to practise – I can’t quite give it up, but there’s lots of lonely places outside town I can practise. But – cut your hair real short, put on a suit of my clothes and audition for the empty place in the band and. (PAUSE) It’s all yours. GRETEL: Do you think I’d get in the band? ALBERT: If you do, I’ll have my revenge on them. But – if they keep you out – I still keep the trumpet. 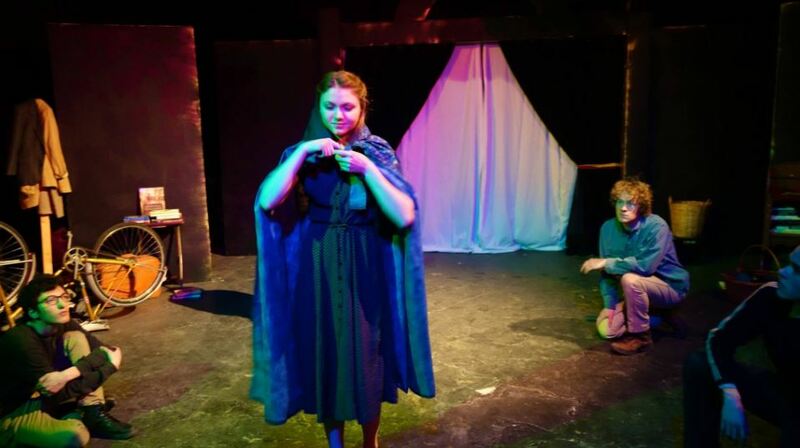 GRETEL: And my hair grows back and I can wear a dress again. Albert. (PAUSE) Albert, let me play a bit. Please. HE DANGLES IT OVER HER HEAD, THEN RUNS OFF WITH IT. 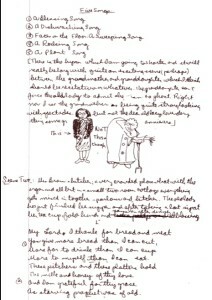 Two pages from the draft manuscript for “I, The Parade” (1981-1982) courtesy Western University Archives, James Reaney Fonds AFC 18. 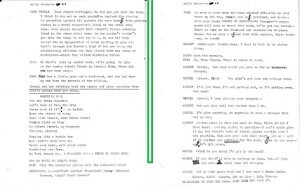 Note from Susan Reaney: This scene is excerpted from a draft manuscript version of I, The Parade, which is part of the James Reaney fonds at Western University Archives. 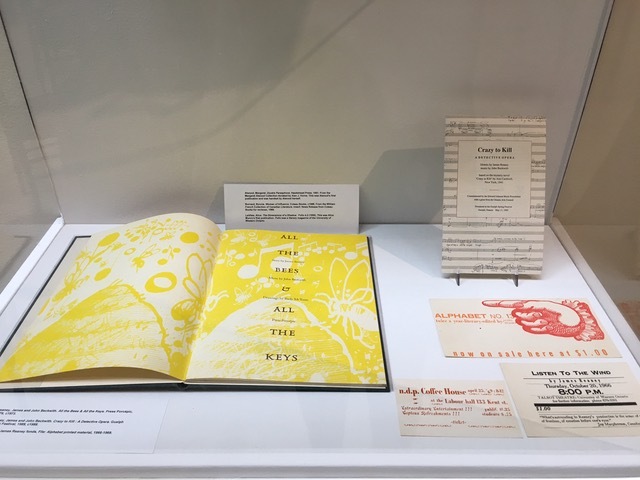 The title at the top reads “Sally Trombone”, which is a ragtime-influenced novelty tune from 1917 featuring a “trombone smear” (true glissando), the specialty of composer and bandleader Henry Fillmore (1881-1956). 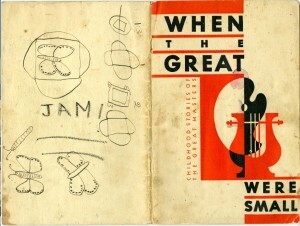 ** John Mellor, Music in the Park, page 18. Illustration by Ross MacDonald from “All the Bees and All the Keys” (1973) from Scripts: Librettos for operas and other musical works (James Reaney 2004). Words Festival, London, Ontario November 4-6, 2016. 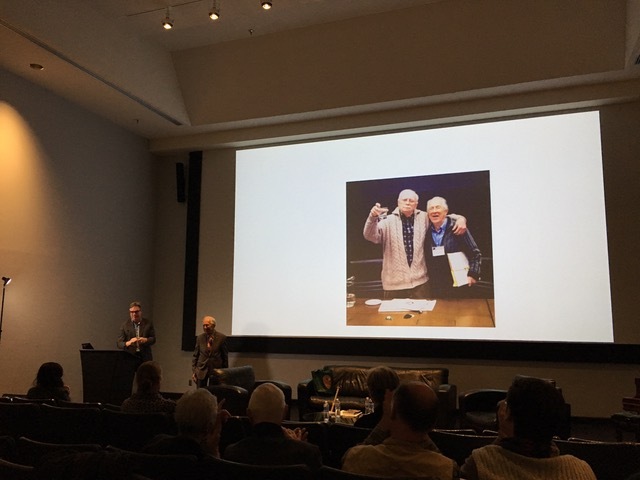 Thank you all for coming to Museum London for the Seventh Annual James Reaney Memorial Lecture to hear composer John Beckwith speak on “James Reaney and Music” and their collaborations together. John Beckwith was the first composer to set James Reaney’s poetry to music. Thank you, John, for sharing your memories and your music with us. 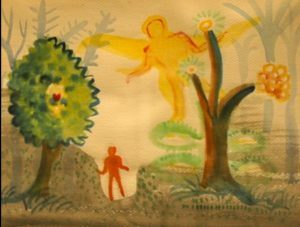 We hope to see you all again next year when author and curator Tom Smart will give a talk on James Reaney’s visual art. 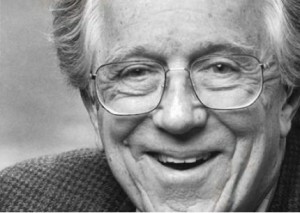 For more about composer John Beckwith, see his 2012 autobiography Unheard of: Memoirs of a Canadian Composer, available from Wilfrid Laurier University Press. 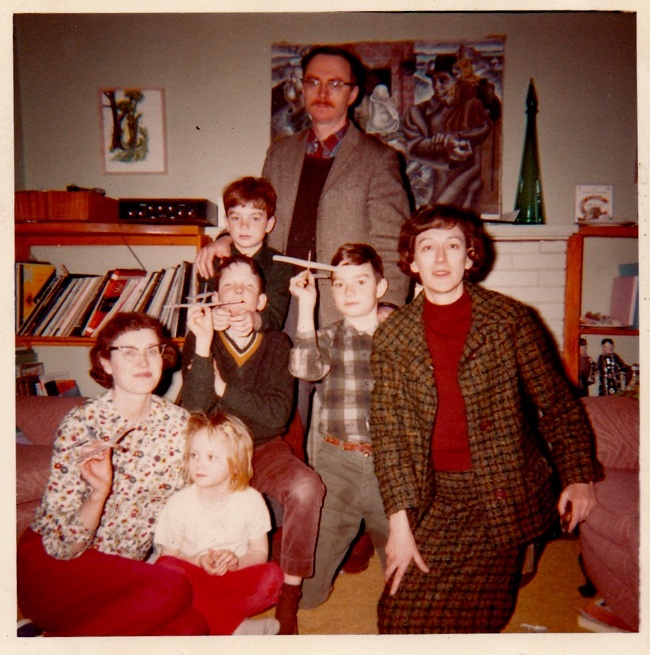 The annual lecture series celebrates the life and work of Southwestern Ontario poet James Reaney, who was born on a farm near Stratford, Ontario. 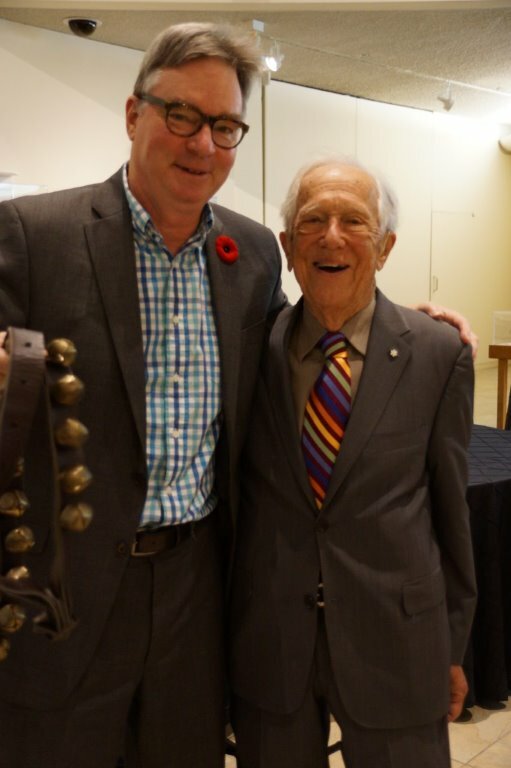 Join us on Saturday November 5 at 4:30 pm at Museum London to hear composer John Beckwith speak about his 40-year collaboration with poet and dramatist James Reaney. 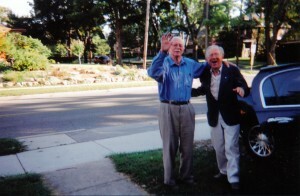 James Reaney and John Beckwith, Summer 2003, in London, Ontario. Photo by Colleen Reaney. 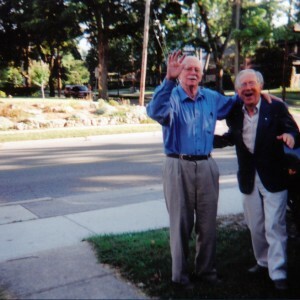 John Beckwith and James Reaney became friends during their student days at the University of Toronto in 1946, and a shared love of music drew them to collaborate on several operas, plays, and musical collages. Four operas Night Blooming Cereus (1959), The Shivaree (1982), Crazy to Kill (1988), and Taptoo! 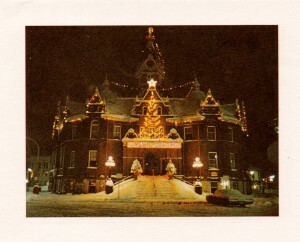 (1994) are among the most notable. Archived recordings of several Beckwith-Reaney works are available for streaming at the Canadian Music Centre‘s Composer Showcase. Admission is free; James Stewart Reaney, James Reaney’s son, will introduce the speaker. 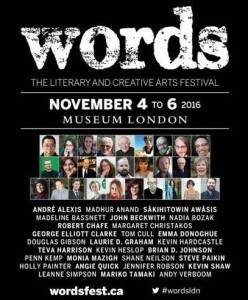 Our thanks to Wordsfest and the London Public Library for their support of this event. The annual lecture series celebrates the life and work of Southwestern Ontario poet James Reaney, who was born on a farm near Stratford, Ontario. 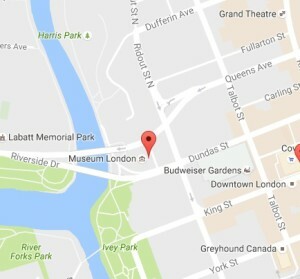 Museum London is located at 421 Ridout St North, London, Ontario. 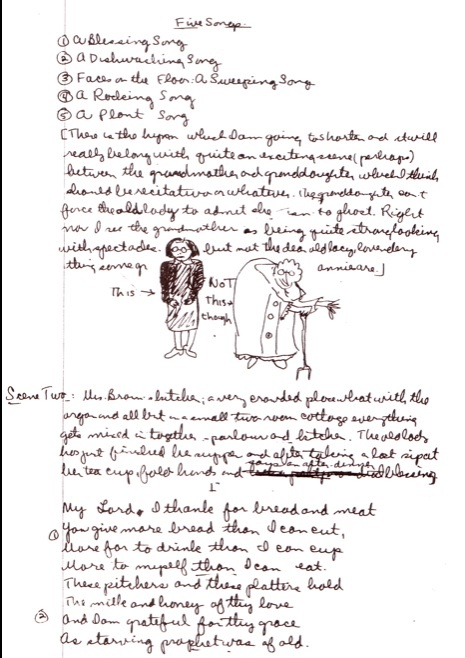 From John Beckwith’s 1997 book, Music Papers: Articles and Talks by a Canadian Composer (page 219): Page from James Reaney’s draft of the libretto for Night Blooming Cereus, with notes on the central character, Mrs. Brown (Faculty of Music Library, University of Toronto). August 23-29, 1965 in Leith, Ontario — Family friend Leith Peterson shares this Polaroid photo taken by her mother, Jay Peterson (1920-1976), who invited James Reaney and family up to her cottage at Leith to create the marionettes for James Reaney’s children’s play Apple Butter. 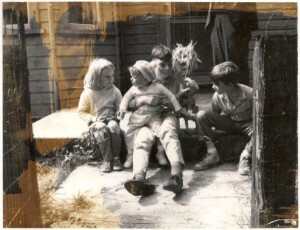 Here are the Reaney children (James, John, and Susan) and Jay’s niece Elizabeth Tinker with new-made marionette Apple Butter, soon to make his stage debut at the Western Fair in London (September 3-12, 1965). 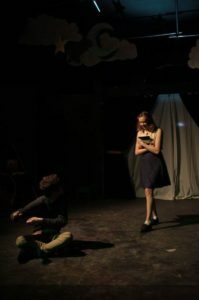 For more about Jay Peterson and her role in commissioning the marionette plays and helping create the marionettes, see Leith Peterson’s article, “Jamie and Jay Peterson’s 1965 Apple Butter Collaboration”. James Reaney and family in 1965 in Leith, Ontario. Standing left to right are the adults: Colleen Reaney, Wilma McCaig (Jamie’s sister), and James Reaney. 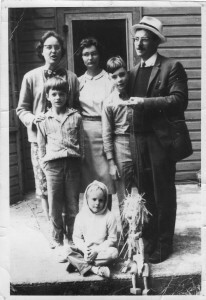 The children are John Andrew Reaney, James Stewart Reaney, and Susan Reaney (beside Apple Butter). Photo by Jay Peterson.